Join the Sustainability Champions and the students of Geography 489 (Alternatives in Sustainability) in celebrating Campus Sustainability Day on Wednesday (Oct. 24). Before the Flood film screening and panel discussion at 4:30 p.m. at Gary Ransdell Hall Auditorium. Feed a Friend will be accepting food and cash donations for the food pantry Wednesday and Thursday (Oct. 24-25). Drop off at the WKU Store from 7:30 a.m. to 6 p.m. both days or outside Fresh Food from 11 a.m. to 2 p.m. Wednesday. Eat Local! Local foods will be on the menu at Fresh Food and Hilltopper Hub. Zero Waste Mini Carnival from 10:30 a.m. to 2 p.m. at Downing Student Union. Join the Recycling and Surplus staff to learn about zero waste in a fun way. Carpool and Donuts! 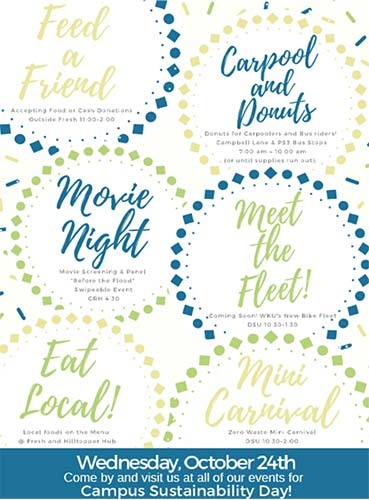 Parking & Transportation will be providing donuts at the Campbell Lane and PS3 bus stops in celebration of new carpool parking spots and park and ride from 7 a.m. to 10 a.m. or until supplies run out. Meet the Fleet! The VeoRide bikes will arrive on campus soon. See one of the bikes from 10:30 a.m. to 1:30 p.m. at Downing Student Union.